Home to roughly 90,000 residents, Lynn, Massachusetts, is a vibrant community with a rich history and fabulous location. Situated in the eastern part of the state, Lynn sits on Massachusetts Bay’s northern shore. It is the largest city in Essex County and is bordered by Salem and Peabody on the north, Revere and Nahant on the south, the Atlantic Ocean and Swampscott on the east, and Saugus and Lynnfield on the west. This commercial and urban manufacturing center is only nine miles from Boston, fifty-one miles from Worcester, ninety-five miles from Portland, Maine, and two-hundred twenty-nine miles from the one and only New York City. Beyond its fantastic location, Lynn is home to a number of exceptional attractions including Gannon Municipal Golf Course, Lynn Memorial Auditorium, Manning Field, Frasier Field, Lynn Heritage State Park, and Lynn Woods. Lynn Woods Reservation encompasses nearly one-fifth of Lynn’s total land area and is in proximity to Routes 95, 1, and 128. This 2,200-acre park provides public green space and clean water to area businesses and residents. This exceptional park dates back to the late 1800s. Prior to that time, the area was grazing land. Trails and roads were constructed in the area in the 1930s, in addition to Happy Valley Golf Course. Since then the area surrounding the park has continued to grow in popularity among prospective homebuyers, as the number of attractions and amenities in the area has also increased. Speaking of attractions in Lynn Woods, Dungeon Rock is one of the favorites. Dungeon Rock has its own intriguing history and can be toured by appointment. 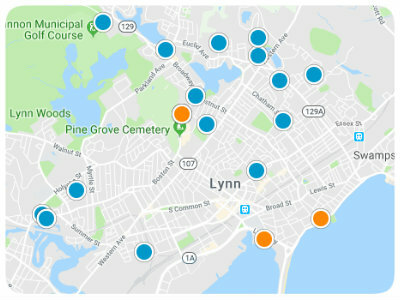 If you are considering buying a home in Lynn, you should definitely consider the properties in the Lynn Woods area. Lynn Woods real estate includes many different housing types in a relatively broad price range, and if you would like to learn more about available properties near Lynn Woods, please contact us so we can assist you.